Announced just last month at the Baselworld watch fair, Casio’s first ever ‘full metal’ 5000-series G-Shock watches will soon be available here in Singapore. 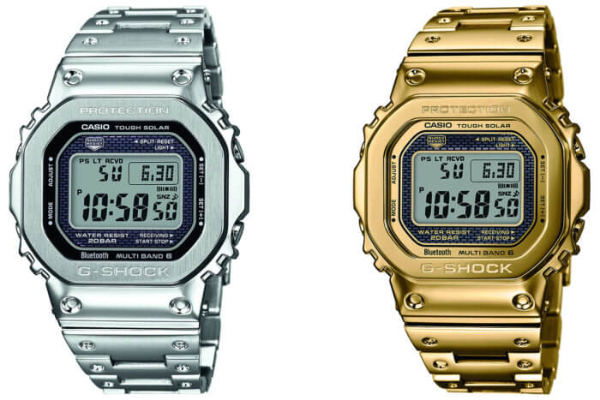 The two models are the silver stainless steel G-Shock GMW-B5000D-1 and the gold ion-plated G-Shock GMW-B5000TFG-9. They will come with stainless steel outer and inner cases, a screw-down DLC-coated case back, Tough Solar power, Multi-band 6 radio atomic timekeeping, and also Bluetooth connectivity.